On the surface, Little may seem like just another Big-inspired body-swap movie, but it’s a little more significant than you may realise, particularly with the inclusion of its young lead, Marsai Martin. The 14-year-old actress, best known for her breakout role in the hit TV sitcom Black-ish, is also listed as an executive producer on the film, making her the youngest person to ever receive such a credit on a major Hollywood studio release; regardless of the film’s overall quality, that in and of itself is pretty awesome, and it speaks volumes to the power of not just African-American representation in film but also of the newer generation of storytellers, as Martin also pitched the movie to Universal. Watching it, you can kind of tell that Little came from the mind of a young person, but not necessarily in a bad way; it’s certainly not the most original concept in the world, and there are parts of it that don’t entirely add up, but overall there is a rather charming sense of innocence that seems to have gone into the making of this, particularly from a girl barely in her teens who just wants to tell a fun and amusing take on an old formula, and while it’s not going to change the world it never feels like that was its overall goal in the first place. The film starts out with Jordan Sanders (Regina Hall), a wealthy but incredible obnoxious tech mogul, making her life a living hell for her employees, especially her long-suffering assistant April (Issa Rae) who usually bears the brunt of her boss’s demanding and unreasonable requests. One day, Jordan goes too far when she belittles a young girl performing magic tricks outside her office building, and with a flick of the girl’s magic wand she be little herself; her thirteen-year-old self to be exact (Martin), to both her and April’s shock. Even worse, when child services gets a whiff of a young girl not being in formal education, she is forced to attend her local middle school or else April, presumed to be the child’s guardian, will go to jail. You kind of get the gist of things if you’ve ever seen a movie like this, whether it be Big, 13 Going On 30, 17 Again or even Shazam! ; there’s life lessons to be learned along the way, friendships to be formed, and realisations about not being so hard on people and most of all themselves. Like I said, this is a certain formula that has been done to death, even more recently with Shazam! which this movie can’t even compete against when paired next to it, but it’s not a movie that’s cynically designed to ape off the ideas of those other movies, either; while it is certainly predictable with every one of its twists and turns being incredibly easy to figure out, it makes up for that slightly with an amusing execution that’s got a fair amount of heart to it. The central dynamic between this newly-transformed teenager and Issa Rae’s character is fun, with both actresses clearly having a blast throwing quips and insults back and forth with each other, especially during an extended sequence where both spontaneously start singing a Mary J. Blige number in the middle of a restaurant, but also when it comes to having them bond during quieter moments it’s also rather sweet and their chemistry is nice enough to buy when it gets into some slightly deeper territory. Martin, in particular, is having the time of her young life, completely relishing in the opportunity to play a 38-year-old woman in the body of a 13-year-old and more often than not she scores some big laughs from her delivery and comedic timing, exhibiting more charisma and sophistication than numerous actors more than twice her age. As good-natured as the movie is, however, at the end of the day it’s not an incredibly funny one, with a lot of the humour being very hit and miss or mild variations of jokes we’ve seen done many times before, particularly ones having to do with this sort of situation; there are a few belly-laughs sprinkled throughout, but they’re usually followed by jokes that don’t land as well or feel disappointingly stale. Some of the drama can also feel somewhat forced, especially a sub-plot that sees the lead character become involved with a small group of social misfits at her school who want to perform in the upcoming talent show, which largely feels unnecessary and perhaps one cliché too far; there are also characters who will just randomly pop in and out with very little to do, including SNL veteran Rachel Dratch who shows up as a child protective services agent in one scene but completely disappears from the movie afterwards, even though her character is referenced by name multiple times afterwards. Though it’s probably not going to be a film that many will look back on too nostalgically – especially when there’s a much better and far funnier variation on this formula that’s also playing in cinemas right now – Little does have its moments here and there, even if they are far and few in between. Like I said, there is an underlying charm to its childishness which does come heavily from Martin’s involvement both as its standout lead and as an executive producer, and while it is certainly safe and totally inoffensive, often with gags that more often than not don’t land all that well, it is harmless enough and easy to digest for an audience wanting a familiar, but serviceable, take on an old formula. 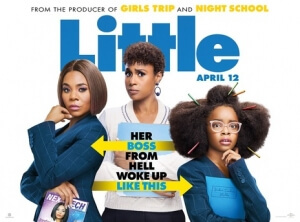 Little is far from original with a concept that has been done to death, but there is an underlying charm to its harmless approach, especially with the involvement of bring young star and executive producer Marsai Martin whose fun performance is enough to carry the movie through some of its weaker moments of comedy.